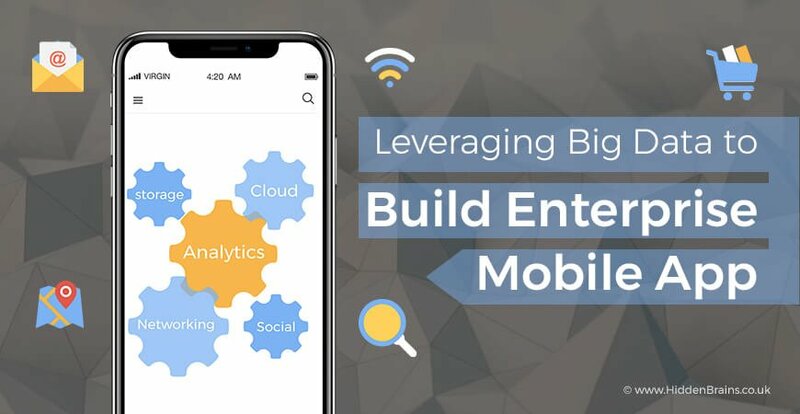 How to Build Successful Mobile Apps using Big Data? Did you know that Big Data technology can be utilized in mobile apps? In fact, several big brands such as Amazon, Uber and Starbucks apps that use big data have experienced success in short time. The large amount of data that customers utilize everyday can be put to use for some fruitful purpose of building mobile apps using Big Data. Insights into the mobile experience of users such as how does the buyer make purchase decision, what influences them and how do they interact with brands in online space helps in building future-ready mobile apps. The competition in the marketplace of mobile apps is quite high. With billions of apps already existing in the market, there is a dire need for apps to be updated with the rapidly changing market trends and customer behaviour. One cannot afford to miss out on any trend as a single mistake may pull you back in the crowd of millions of applications. Big Data helps in gathering and managing large amounts of data and putting it to use by formulating new mobile strategy. Big Data tools are used for deriving valuable insights on consumer navigation patterns, areas of interest and engagement quotient. Big Data technology has come as a boon to mobile apps industry. By using insights derived from Big Data tools, developers and designers could know what is liked by end users and what is disliked. This helps in creating new apps that are more specific to the interests and preferences of target audience. How satisfied are end users with your mobile app? How much do they rate your app on the scale of 1 to 5? If you are suffering from low app retention rate or high churn rate, you must start focusing on delivering exceptional experience to target users. In order to achieve this goal, it is necessary to understand their needs, preferences, choices and interests specific to your nature of business. This requires examining of insights collected from different sources, including social network channels. Big Data Analytics helps in grouping of data as per the defined category to strategically decide the next step based on the study of data. With Big Data analytics tools, it is possible to measure how much traffic mobile app is generating. Further, developers can know which feature of app or page is encountering glitches and problems. By throwing light on problematic areas, Big Data helps in enhancing the performance of mobile app. In short, apps that use Big Data can be constantly monitored for performance improvements. Mobile apps, both new and existing ones, need to stay at par with changing technology trends for wider acceptance and retention rates. Big Data tools help in deriving real time data from apps, which can be effectively utilized in marketing of app. Using real time data, marketers can make changes in the promotion strategy even in the middle of a campaign. By delivering information critical to the business, Big Data helps in taking quick decisions to get good ROI from marketing and advertising campaigns. Mobile Apps using Big Data keep a constant track of end user’s behaviour with respect to their likes, dislikes, timings of usage, duration of usage, user’s needs, expectations, location from where app is being used and more. Analysis and study of these metrics helps in sending of customized and personalized push notification to users. With highly relevant push notifications, users are more likely to engage with the app. High engagement rate directly leads to generating more revenue from mobile app. Mobile apps are at the centre of business’ digital marketing strategy. Improving the user experience by monitoring every aspect of their usage through Big Data helps in standing out from the crowd and getting noticed among target audience. Mobile apps using Big Data can increase your app visibility and bring in more users. Hidden Brains is a leading iPhone app development company that specializes in Big Data technology. With deep technology expertise and industry experience of serving multiple Big Data projects, Hidden Brains is the proven choice for building apps that use Big Data. To develop you Big Data based mobile app, request for a free quote now.